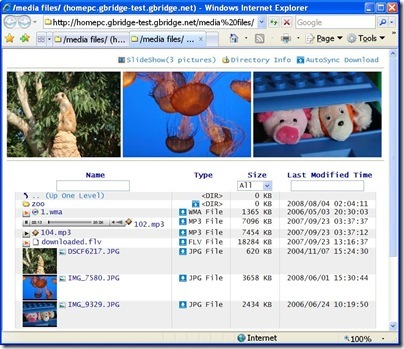 Gbridge is a free software using which you can sync folders, share files, chat and VNC securely and easily. Gbridge utilizes the Google’s Gtalk services to a VPN that allows you to connect your computer to your friend’s computer easily and securely. To start using Gbridge all you needs is Windows 2000/XP/Vista and a Gmail id (Google account). Gbridge uses P2P direct network connection using IPv4 level compatibility while providing authentication, encryption and mobility which provides great network performance. SecureShare: When ever the data is transmitted using Gbridge it is encrypted so you can now securely share your files with your friends. You can share files with your designated friend only this way no other friend who is also present would not be able to see the files that you have shared with the designated friend. Since it utilizes P2P technology your friend would be able to instantly view files that you have shared. Also there is now no requirement of uploading and downloading files to file sharing service. AutoSync: Transfer big files and sync folders from/to anywhere has never been easier. Auto schedule, auto resume, incremental and no size limit. EasyBackup: Setup an auto-recurring local or remote backup of your important files and folders. DesktopShare(VNC): Access your computer desktop remotely or share your desktop with your friend from anywhere.This would be very useful in situations where I can fix my friend’s or a family member’s computer remotely. Most of my family members and friends are present in Gtalk so by using Gbridge it is now easier for me to share files and fix their computer problems remotely. Let me know your feedback if you are using Gbridge. networks solely to attract unsuspecting users. ovpn files in Open – VPN\config folder and uses them for checking. Many network devices have telnet access as an option for management.